So what can we do to reduce our impact on climate change? Carbon dioxide is the main greenhouse gas which causes climate change. Going on national data, over 50% of Bute’s CO2 emissions come from everyday tasks and the way we manage our homes and travel. Our homes produce 27% of CO2 emissions with another 25% coming from domestic transport. Actions such as having insufficient insulation, leaving the TV on standby or the lights on, eating vegetables that have been flown from Peru rather than grown locally, driving inefficiently, and not using public transport where this is possible, all result in unnecessary carbon dioxide emissions. Some people say that there is no point acting as what difference can one individual really make. They say that the government and businesses could do more. Whilst it is true that Government and business could do more, we as Bute residents could do more too. Each and every one of us has contributed to this climate change so each and every one of us has a big role to play in slowing this down. Every person on Bute can make a real difference. 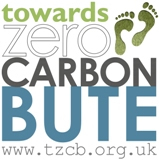 Get involved with Towards Zero Carbon Bute to find out what you can do. We really need your help. You don’t have to take the ‘greener than green’ action every time, but start by making the changes that you can easily make, that might actually benefit you, for example, by saving you money. Leaving the lights on or the mobile phone charger plugged in when its finished charging are just costing you money with no actual advantage to you. Read on, or get in touch with us, to find out what you can do, to help both the environment, and yourself.